Past Projects | Books for Veterans! 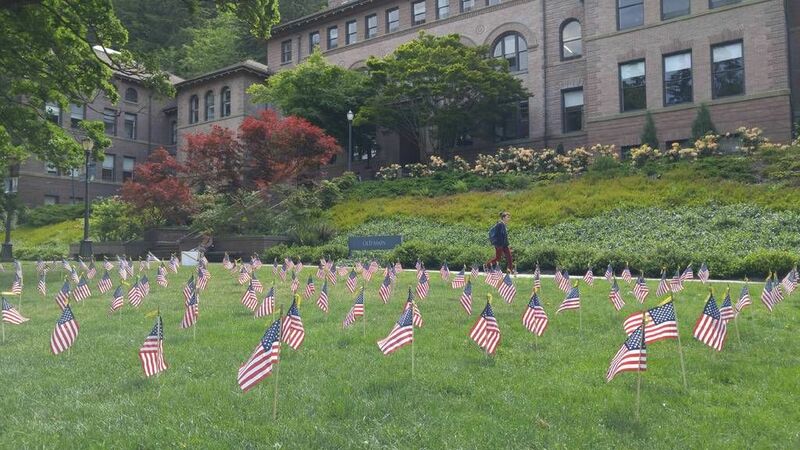 The Veteran Services Office at Western Washington University is currently the hub for the veteran community. Although the community is small compared to other universities in Washington, it is growing every day. We are often our veterans first point of contact, their preferred hangout and a place to land when they are struggling. If there is an issue or financial hardship they will come to us first to talk about what resources the school and the community have to offer. Transitioning from active duty to college can be difficult and burdensome, some students are unable to pay for necessities such as books, transportation or added housing costs. We need your help to support our veteran community as much as we can. We see some of our veteran community students faced with financial hardships and would like to have a reserve fund to support these students. We want them to remain focused on coursework despite any unforeseen financial emergencies. Spread the word about our campaign, Books for Veterans. If you want to support our mission and the Veteran Community students pursuing their education at Western, please donate! May is Military Appreciation Month - let's show them our appreciation! One of the strongest factors of keeping our veteran community in school is helping them to build connections on campus. Our office offers free coffee and snacks every day to keep them coming in and visiting with each other. Help support this connection by buying a cup of coffee for over 20 students. Transitioning to school can be a challenge as pay is interrupted while education benefits get started. The first monthly check might be a bit slow and paying those first bills in housing stretches the budget a bit thin. This donation could help pay that initial power bill as school gets started. The average price of a textbook is now a little over $75. Help soften the blow for a student as they buy one of their many expensive textbooks. A TI-83 calculator costs $100 and is needed for coursework for our students in the math and science fields. Help students "add" to their education by helping with this cost. Many of our students in the veteran community are interested in meeting up with others who have come from similar backgrounds and are familiar with some aspects of the military culture. We like to be able to sponsor events and gatherings to bring them together and build connection such as a "Veteran Vs. Dependent" bowling night, or equipment rental for snow shoeing. Help provide this sort of outing for some of our students. For our students pursuing education in the science field there is often quite a bit of expense in the lab gear needed for class. Lab coats, protective eye wear and other equipment can add up quickly-especially after buying those books. Help sponsor a student get the equipment they need to be successful. Textbooks for a whole quarter! Students using the Post 9/11 GI Bill often exhaust all of their book money in the first two quarters of school and in the Spring are scrambling to pay for their books. Students can spend around $500 a quarter on required textbooks. Your donation could help defer some of that cost. When students start school at Western and are transitioning to using their educational benefits, sometimes their monthly living stipend comes in very late or is smaller than they expected and they don't have the full amount they need to pay rent. There might also be VA errors or some other disruption in their benefits and that veteran community member is now struggling to stay in housing and is unable to focus on school. Your donation can help that person stay focused on school and transition to their new experience with less stress.